A typical Arab dish served with tomato and cucumber salad. This delicacy is made with rice and lamb traditionally. An additional recipe for vegetarians is included. 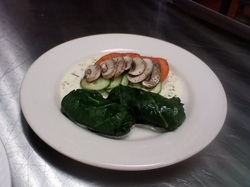 Rolled Swiss chard is a special meal that is available only in the summer. Swiss Chard may be served many ways from yogurt and swiss chard to fried swiss chard with garlic. In a large pan of boiling water, place the leaves and leave for 30 seconds only. The leaves are very tender and should not be left long. Drain the leaves in a strainer and set aside. In a bowl place the rice, lamb, curry, oil and salt and pepper. Mix well and set aside. On top of a large colander place the leaves, one by one. Separate the leaves very gently. In a medium saucepan, place thick slices of tomato on the bottom of the pan. With a large cutting board or tray begin the assembly. Spread open one leaf or two small ones together and in the middle place a small amount of the rice mixture. Starting at the top of the leaf, roll down over the rice mixture, folding in both sides, as in an envelope. Roll the leaf down to the very end and set inside the pan prepared with tomatoes. Keep rolling the Swiss chard until all the leaves are used up. Boil some water and pour over the rolled Swiss chard leaves. Pour the water two inches above the leaves. Add in some salt, around 1 teaspoon and mix in the water. Place a lid or saucer over the leaves to hold them in place and then cover the pan with a tight lid. Cook the Swiss chard leaves for 30 minutes. Check after 30 minutes to see if the rice is cooked and the leaves are tender. Drain the water off and serve on a platter with some lemon wedges. In a blender place the tomatoes that have been cut into small pieces. Pulse the tomatoes until they are completely mixed. Pour the tomatoes in a bowl. Add in the rice, oil and seasonings. Chop the parsley, coriander and mint and add to the rice mixture. Follow the above directions for the completion of the rolls. Place all the ingredients in a bowl and mix slightly. Add the juice of a half of lemon and some extra virgin olive oil as a dressing. Serve in small bowls to serve. Rolled Swiss chard is made the same way as grape leaves and cabbage rolls. They have similar fillings, but each has its own special flavors. Arabic cooking is simple with the serving of a salad and a few bowls of yogurt on the side. Water and drinks are typically served after the meal and then it is traditional to serve a cup of tea with some mint or sage.